"I remember it very clearly. I don't know why my imagination has transformed reality. 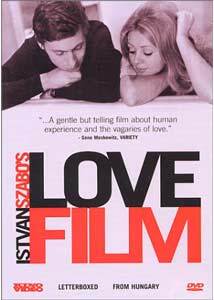 Still, I always see Kata on the swing..."
Lovefilm (Szerelmesfilm), acclaimed Hungarian director Istv�n Szab�'s third feature, examines the lifelong relationship between a man and a woman, as friends, lovers and strangers. Told through a series of disjointed and nonlinear reminiscences, the film presents the merging of subconscious idealism with the sharp contrast of reality. A collage of moving snapshots, marking the pivotal moments in their lives together, flow through the main character's mind as he prepares to reunite with a long lost friend. Written by the director, and no doubt highly influenced by his own upbringing in Budapest, it presents a tale of two souls drawn together, yet destined to grow apart. Leaving his current girlfriend behind, Jansci boards a train to Paris, where he has plans to meet up with Kata, a girl he has known, and loved, all his life. They grew up together in Budapest in the years before the second World War. As young children, they were inseparable, sharing the kind of relationship children do; sometimes happy, sometimes cruel, but with an underlying devotion that overcame any temporary rifts. With the invasion of the Nazis they were separated, but chance would reunite them as teenagers, where their innocent friendship blossomed into young love. Once again, social upheaval would tear them apart, with the riots and communist occupation of the mid-1950s. Kata decided to leave for Paris, while Jansci remained in Hungary. The two had managed to keep in correspondence with one another in the intervening years, and now, they will meet again as adults, and discover whether their shared past can be the basis for a future together. As flashbacks through the course of the film, Jansci recalls the many stages of their relationship. Szab� does an exceptional job conveying the influence of memory in its randomness and selectivity. Several events are replayed over again, each time with a different perspective, recalling one aspect of the situation as another fades into oblivion. This attention brings a striking realism to the piece, defining the difference between what really occurred and its afterimage. The audience is never really sure that what they are getting is authentic, or merely an interpretation of events. Lovefilm was Szab�'s first effort in color. Cinematographer J�zsef L�rincz makes good use of the medium by varying the tone in different sections of the film, from the greeny greys of Budapest, to the warm summer hues of the beach scenes. His earlier work was heavily influenced by the French nouvelle vague, and while there are passages that reflect this lineage, the film moves in a bolder direction, marking the end of the first stage of the director's career before moving on to international acclaim with works such as the Oscar�-winning Mephisto (1980) or the compelling Colonel Redl (1985). The acting is subdued and natural, the style both intimate and detached. While it plays a little on the long side, it succeeds in imparting a feeling of nostalgia, where those fragments of the past live on in the subconscious, giving hope and solace, even if their eventual outcome differs from that desired. Image Transfer Review: Lovefilm is presented in a nonanamorphic 1.66:1 transfer. Overall this looks quite good, very European in its palette. Saturation levels are intentionally varied, though sometimes a little dark and murky, however colors are generally rich and earthy, with sold blacks. Grain looks natural, and details are well preserved. There is some aliasing and interlace artifacting throughout but source defects, while frequent, are fairly minor. Backgrounds do tend to show some occasional artifacting issues, but whether this is compression or a processing byproduct, I can't say. Audio Transfer Review: Mono Hungarian audio is presented well, with a reasonably full sounding mix for the time. There is some excess sibilance, but hiss is nonexistent, and other anomalies minimal. English dialogue is provided by burned in subtitles. Extras Review: There are no extras. Istv�n Szab� adeptly visualizes the power of the imagination to influence memory in this tale of two star-crossed lovers. Set against a backdrop of Budapest's often violent history, the story of their lives unfolds through a series of remembrances and dreams as a young man travels to meet an old friend. A remarkable and intelligent film. Recommended.